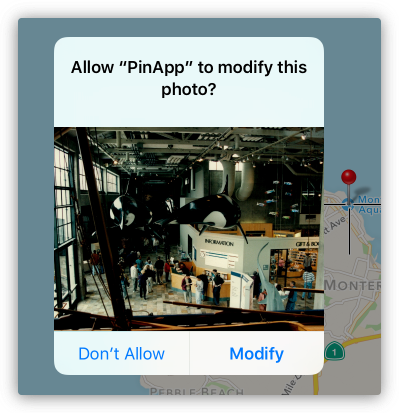 The pins on the map denote the geotags of your photos. You move the map to find the location where a photo was taken, then you assign this location to the photo. You can also use the map to see where you have taken photos. 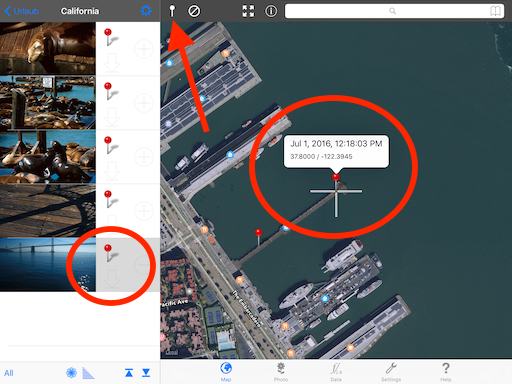 Select a pin on the map to show the photo in the photos list. 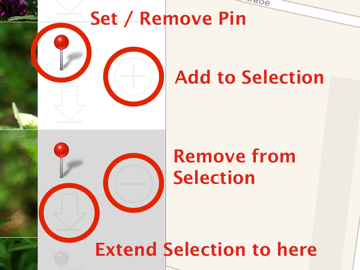 As an alternative you can set a pin by holding one finger on the desired location. To select a single photo tap on the small thumbnail photo. To extend the selection, tap the downward arrow: all photos from the currently selected photo above to the tapped photo are selected. Please note: Tapping on the pin will set/remove a pin, but only if you are in Map mode! The geotag is changed accordingly. Red pins denote geotags for single photos. Tapping on a red pin shows the callout above the pin with some basic photo infos (or with the image title if one is given), and the photo is selected in the photos list on the left. 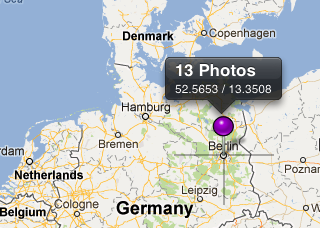 Purple pins denote multiple photos taken at the same location. Tapping a purple pin shows the number of photos behind the pin and selects all respective photos in the photos list.